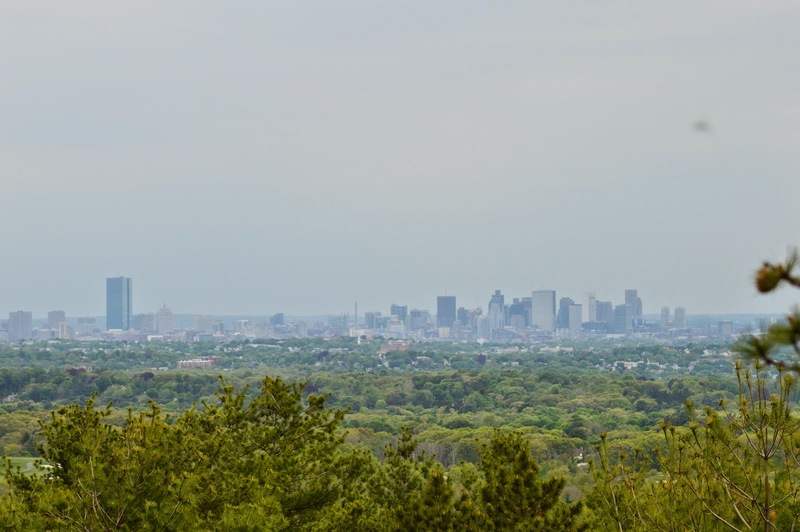 Blue Hills is one of the more visited parks in the South Shore region (south of Boston). It is precisely this reason that it is often taken for granted. So, when I decided to start this blog, I couldn’t resist starting with this old standby. 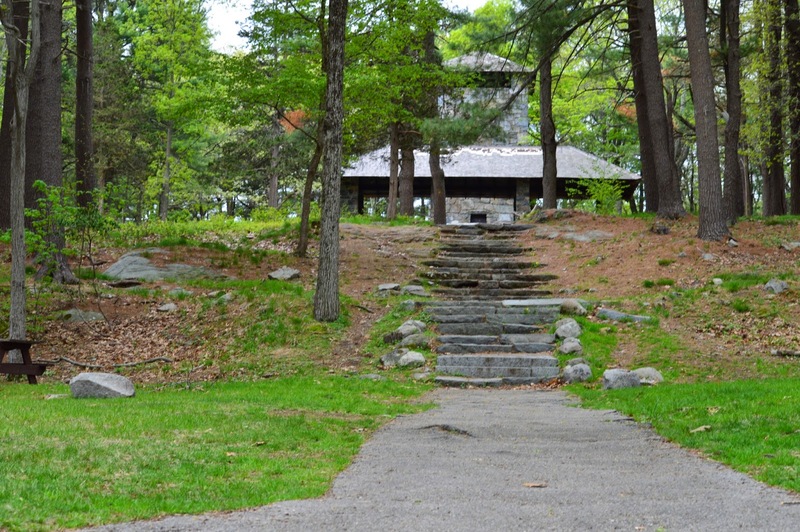 Nestled in the “main entrance” (the actual entrances are off Granite Street or Hillside Street depending on the direction you’re coming from) is a picnic area. A structure in disrepair stands in front the Chickatawbut Observation Tower. Unless you’re visiting during off peak seasons, you’ll be hard pressed to find a designated parking spot at Blue Hills on a weekend day before noon. Parking is allowed in obvious spaces on the side of the road so long as other cars can pass. “Obvious” does often leave a little to the imagination, however. 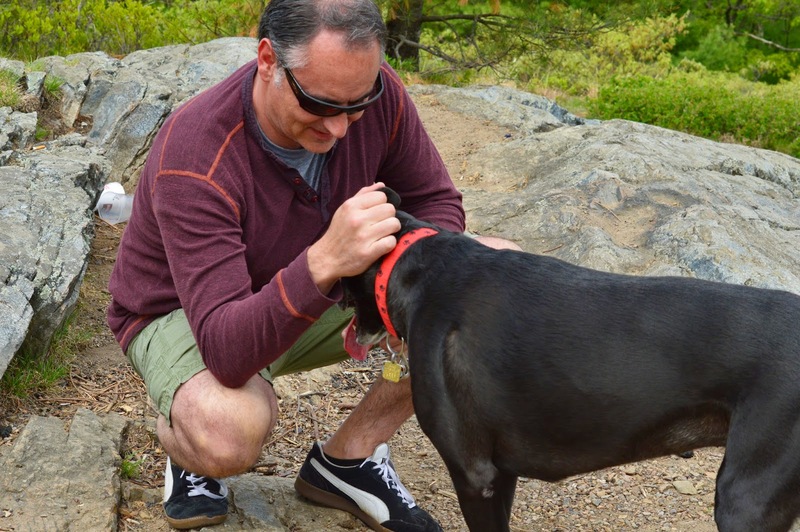 As you may already know, Blue Hills is a pet friendly, well dog friendly, park. You’ll find many dogs on the trails and paths, some unleashed (although they’re supposed to be leashed). But, most dogs behaved themselves. I even I made a friend, Bailey. Not sure what the guy’s name is, though. 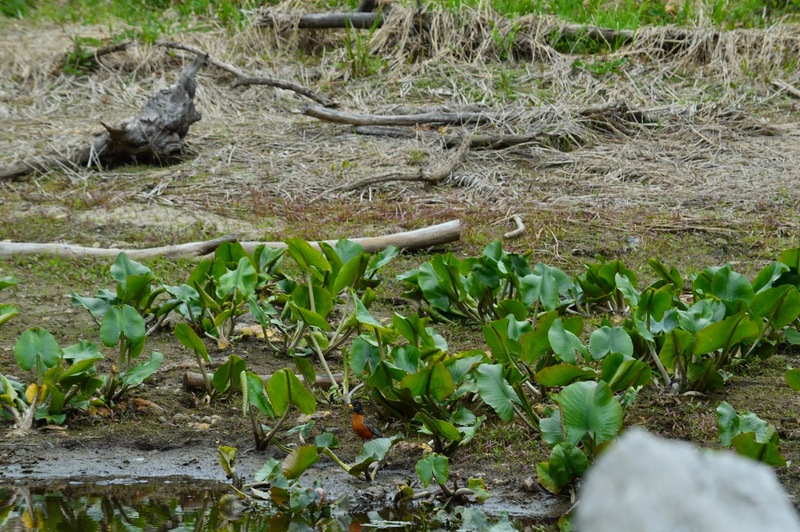 There are an array of bird life and other critters at Blue Hills. 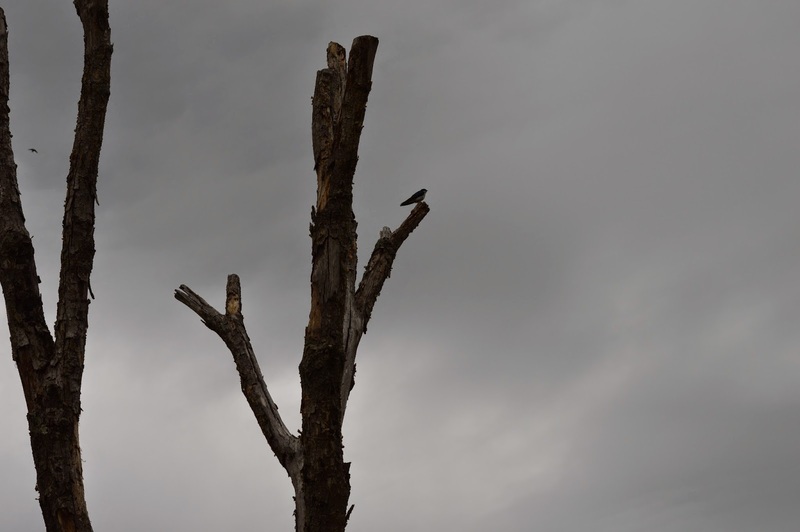 Birds of all stripes fly overhead. If you’re lucky you might even shoot one during your travels. I was lucky enough to spot this robin. Apparently, it’s also an ideal place for a party. Who knew? Although this party doesn’t seem to have gone off very well. 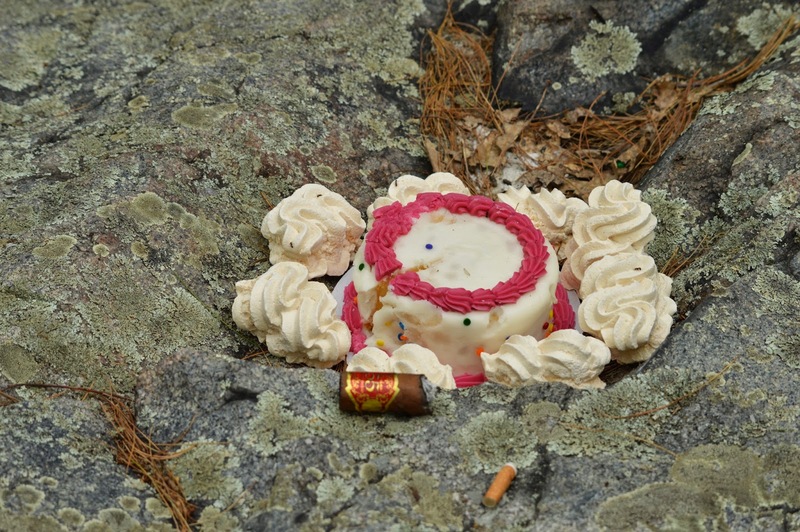 Yes that is cake and a stogie, mmmmm. The views are decent, although trees and branches can obstruct an otherwise good photo opportunity. In fact, one of the best views is right in the parking lot. 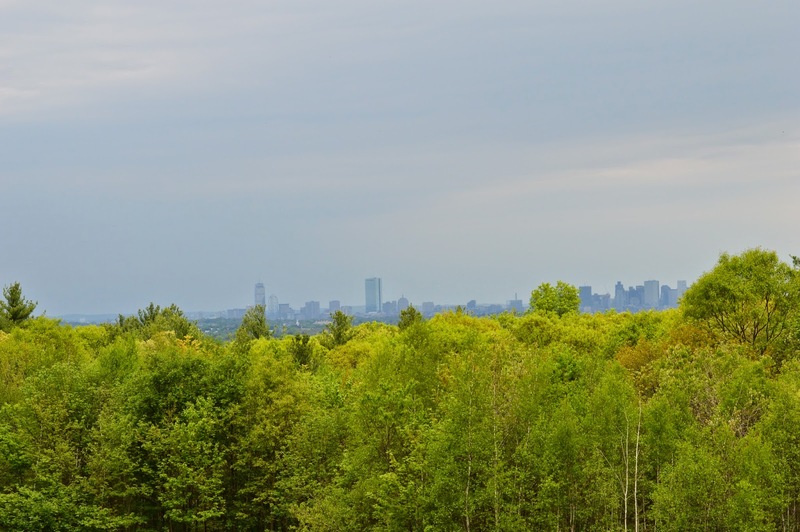 The main parking area and picnic area provides the backdrop for an unfettered view of the Boston skyline. The sky, being overcast, didn’t offer the best shot but on a sunny day or during sunrise and sunset, the view is much more pretty. While the DRC does a good job trying to stay on the upkeep and volunteers do help out with the upkeep, there were few areas with graffiti and litter. But, overall it is fairly clean. 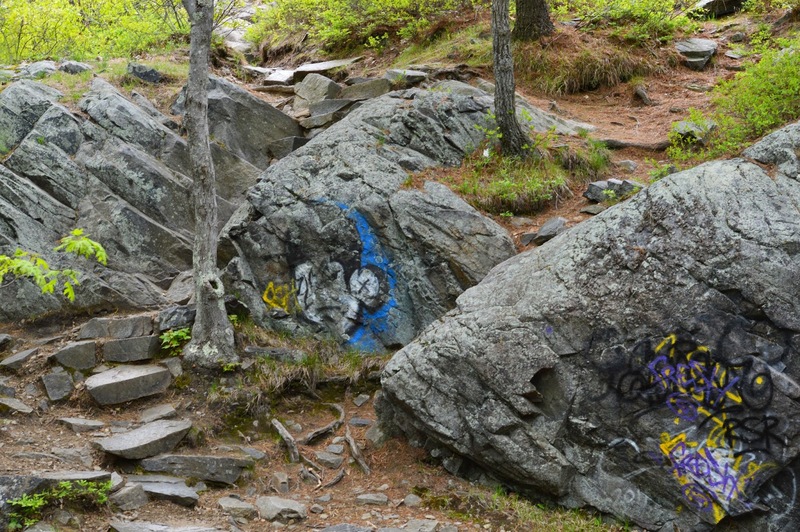 The main trails are well defined and safe to walk on but then you come across something like this. 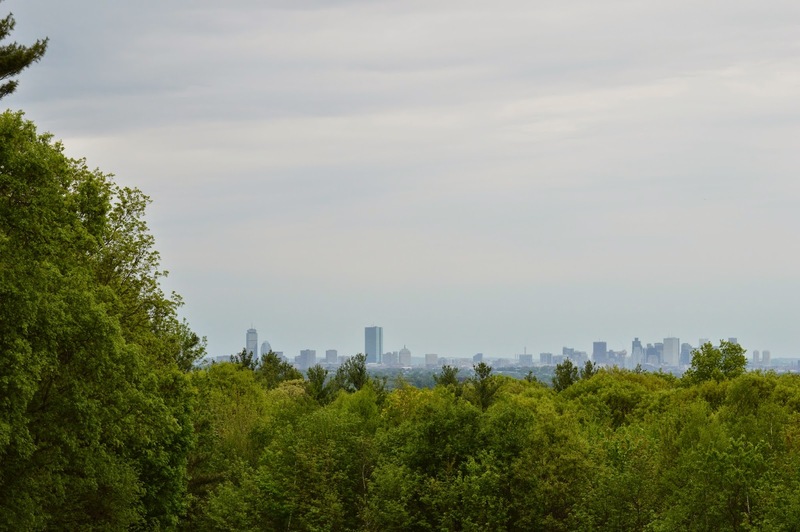 While still passable, it may be better for some people to stick to the “beaten path.” But, the treacherous paths are worth traversing to see the views of Boston. 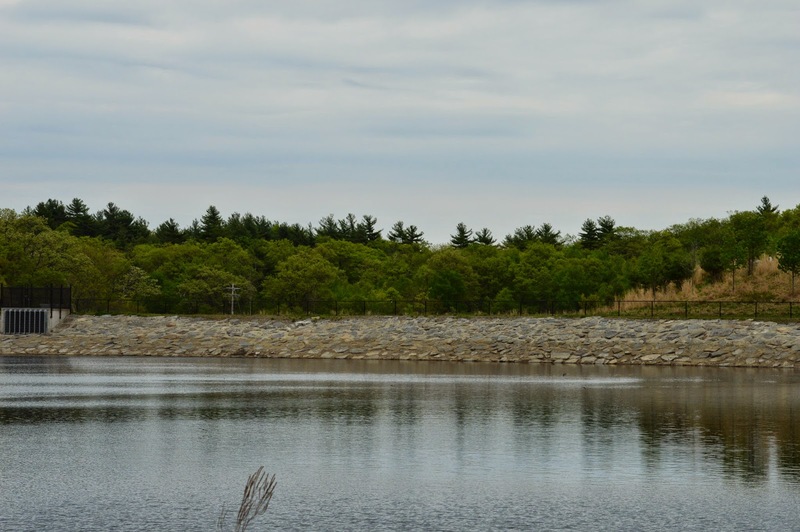 Houghton’s Pond is also within walking distance from the main parking area of Blue Hills. 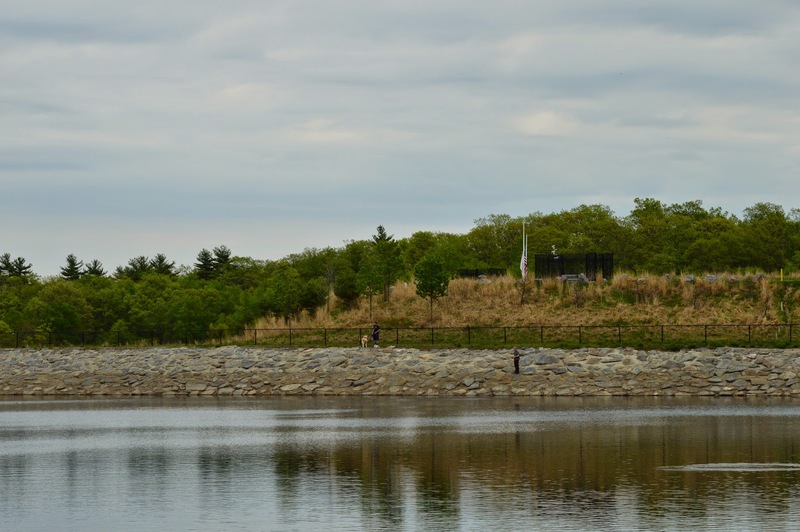 It’s not uncommon to see people fishing and engaging in other activities. 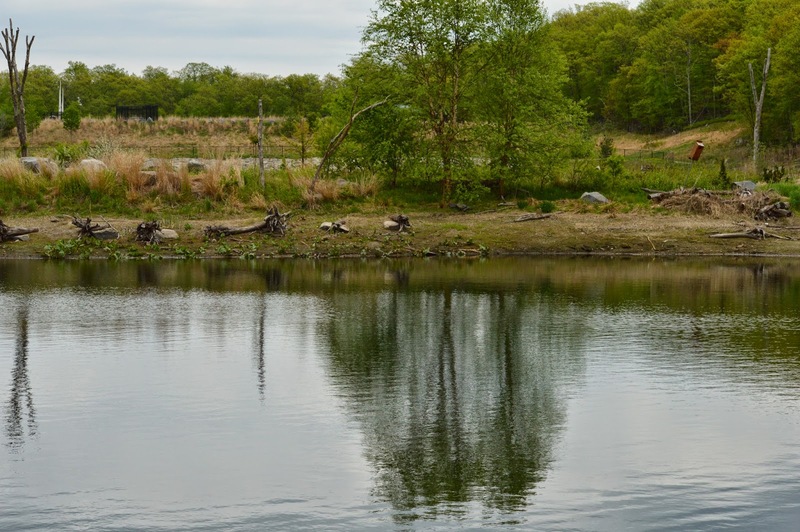 The water attracts a variety of birds who stop by for a quick dunk or to wet their beaks. 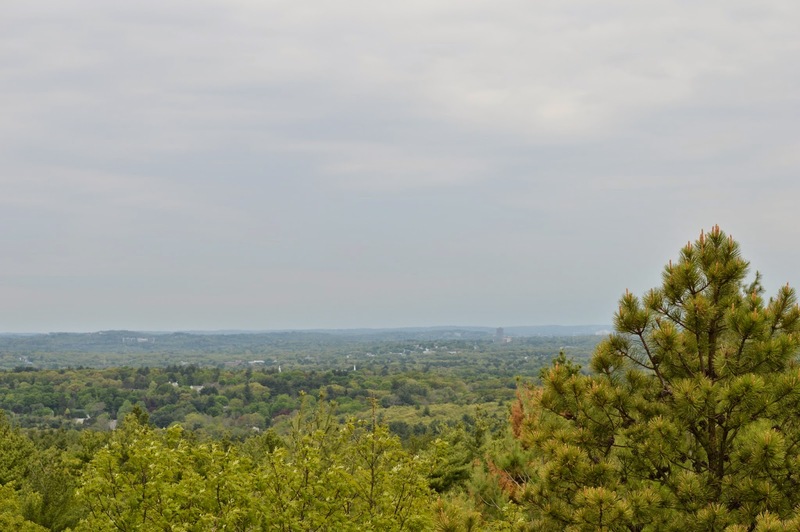 I was unable to visit the weather observation center at Blue Hills. But, it is a popular attraction. I will have to make time for it next time. 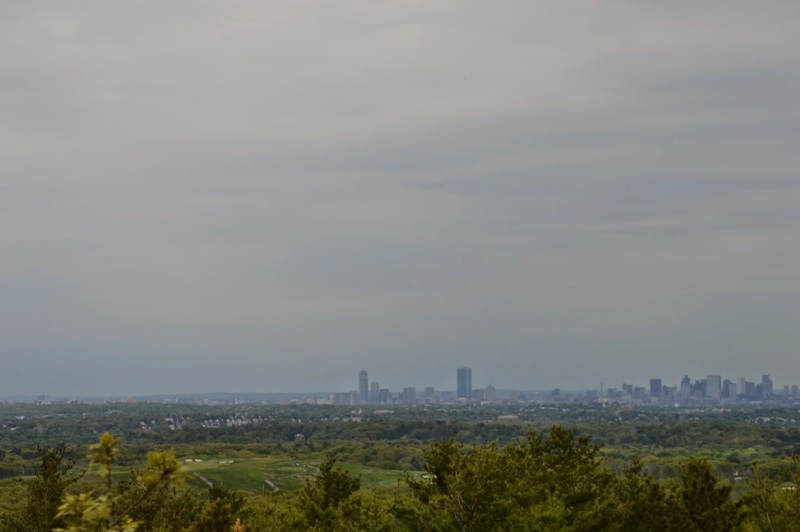 In closing, during my visit at Blue Hills, I noticed how the most innocuous things in our lives can leave an impact on us. Such was the case when I came upon this. Who is D.M.? Who is E.S? Are they still together? 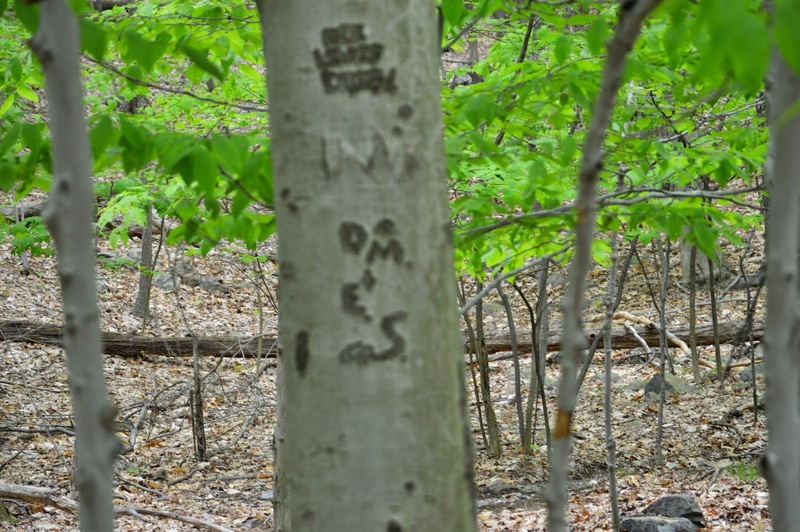 How many other couples have etched their initials into other trees? So many people pass through these reservations. It makes you feel a connection to other people and to nature, if only for that fleeting moment. 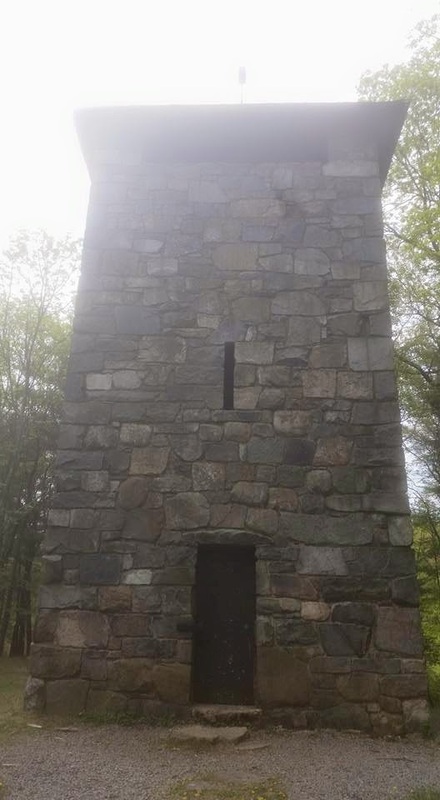 This entry was posted on Saturday, May 16th, 2015 at 10:45 pm	and tagged with Blue Hills, Hiking, Historical, Nature, New England, Park, Photography and posted in Uncategorized. You can follow any responses to this entry through the RSS 2.0 feed.